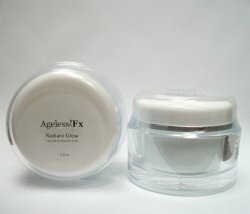 The Home Microdermabrasion Kit in a Jar! Make an Instant Impact! Boost your radiance by removing those dead skin cells and leftover residue from oils, smoke, lotions, and dry skin. Its like having your own home microdermabrasion kit. For Spa use or in your home. Gentle yet effective. Friday night date night will never be the same. This lightly scented scrub with exfoliating beads is perfect for weekly sloughing away of that dry outer layer of dead skin cells. Men and women will comment on the beautiful skin you have uncovered. Moisturizers and emollients included. Jojoba and Carnauba Wax will leave you feeling smooth and soft. We added just a touch of Natural Fragrance for that extra clean feeling. Of all the anti-aging products you'll use - you'll feel the difference with Radiant Glow and the World's Best Moisturizing Serum! It's easy to use and quickly gets results. Formulated for all skin types and ages, our microdermabrasion scrub will give you that Radiant Glow!